The Marketplace is the heart-piece of our social and mirror trading platform. It is where you can browse the best strategies, templates, signals and even share your own crypto knowledge. Did you hear about a high-performing strategy, signal or template on our social channels? Be sure to find them on the marketplace, using the search bar. 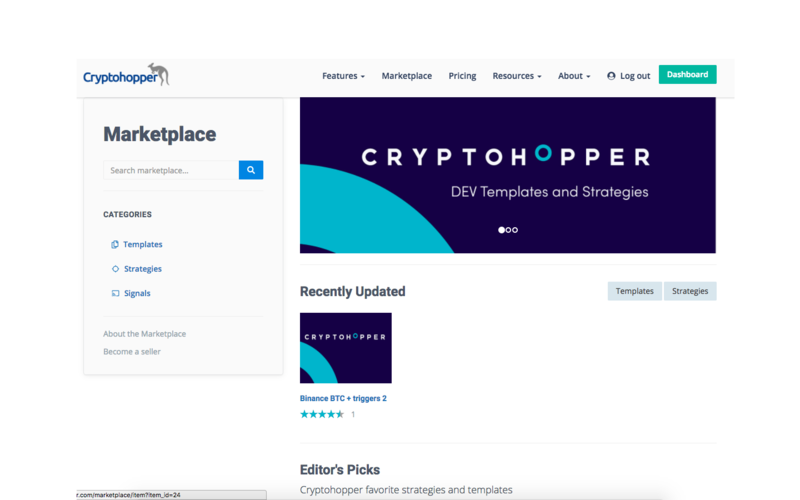 When you download a template it will be shown in the “Your hoppers” section under “Market templates”. Downloaded strategies are shown in the “Strategies” section under the “Market strategies” tab. We want users and sellers to have the best possible experience on our platform. That is why we give you the chance to report abusive behavior, allowing us to identify and expel wrong-doing. When clicking on a marketplace item, scroll down to "Report Abuse" button, fill out the form and our support team will review the seller. Under “Templates“ you can sort all available templates by their corresponding base-currency and exchange. 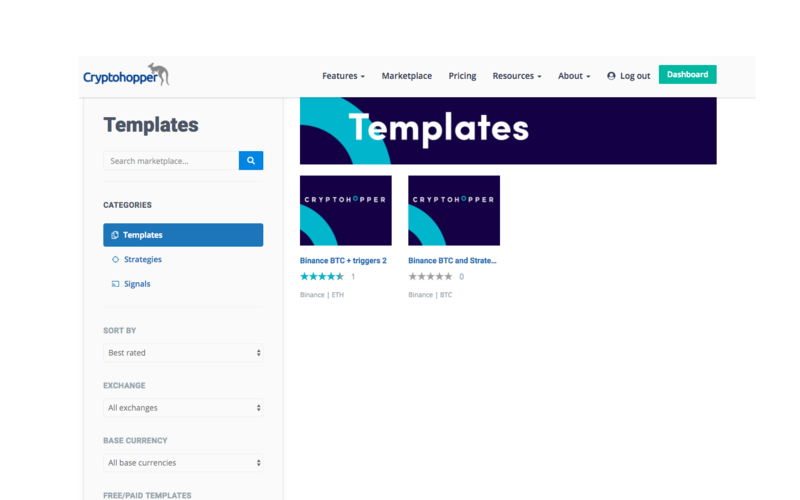 This ensures that you only pay for templates that are compatible with your personal settings. You can also filter the templates based on their ratings, total downloads, modifications, and recentness. When selecting a template you are taken to its overview. Here you can see the description and get a look into the template’s settings. Click on the download button to subscribe. All subscribers can write reviews about the template and rate them on a scale from 0-5. Templates will in many cases come with signals. Lastly, you can enable “Auto-updates”. This means adjustments made to the settings by the seller will be automatically adopted. When this is disabled you will be notified of any changes and will have to manually approve them. For paid templates, you will have a refund period of 30 mins. During these 30 minutes, a refund button appears on your selected template. You can likewise sort all available "Strategies" by their popularity, rating, and recentness to find the very best option for you. As a subscriber, you can rate and review strategies. Once subscribed, you may also able to see the configuration given the seller has not hidden the settings. For paid strategies, you will have a refund period of 30 mins. During these 30 minutes, a refund button appears on your selected strategy. 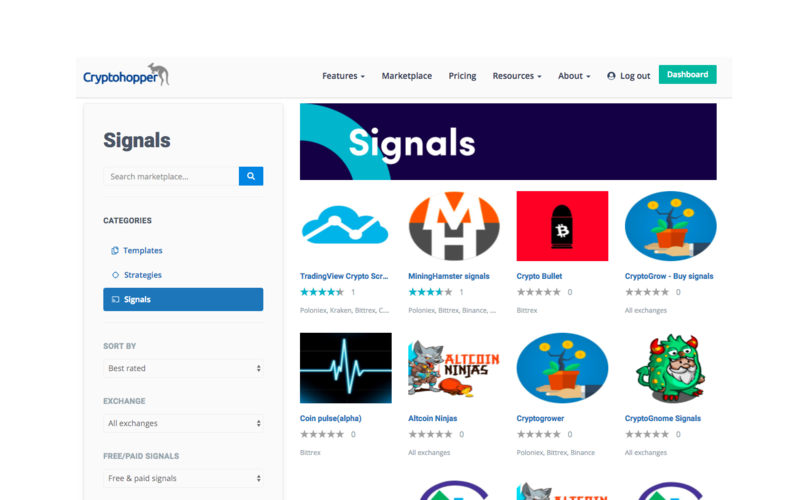 Lastly, you can also find “Signalers” in the marketplace. If you are unsure whether a particular signaler has sent signals that correspond with your exchange, filter them according to the exchanges we offer on the platform. Check out the performance review of a signaler. Here you will see all-time returns, the total number of subscribers, as well as the last 10 buy or sell signals.